This is the series of blog posts about the functional approach to cloud computations and big data using F# and MBrace framework. MBrace is fully open source framework written in F# and offers very clear and easy programming model. It aims to create all the necessary conditions to make distributed cloud scale computations and data as simple as possible. At the same time it is totally straightforward to setup MBrace clusters. In this series you will get the concept of "cloud monads" or cloud computation expressions, find out how to create a cluster and configure the environment, explore the features and opportunities we have with new F# functional cloud programming model and view the code of MBrace examples. Here, in the Part II of the series you will see the infrastructural options of creating the cluster for MBrace. If you want to know more about the concepts and the approach behind MBrace - it may be interesting to have a look at Part I.
MBrace is a framework for big data and highly loaded computations. It is a programming model for scalable data scripting and data processing using F# and C#. It can be used on a public or private cloud. Azure cloud platform supports MBrace and it's absolutely easy to get Azure cluster for it using Brisk Engine. You can use your own data centers as well, so it is not limited to any cloud vendors. Small note: Though MBrace is itself absolutely free, it implies and assumes using the underlying infrastructure and tools, which may require some costs. Sure, you can go with 100% free MBrace configuration using your own ecosystem, but it means you would have to perform all configurations and setup work fully by yourself. If you don't mind having some dirty work done for you by other clouds, like Azure with MBrace - you may want to pay for Azure cluster, which is now the most popular option for MBrace cluster. Anyway, all decisions are up to you and it's always the trade off between the comfort and cost. What do we need to start with MBrace?... Sure, you need a CLUSTER! What options do you have? Actually, there is a big variety of options, it all depends on your goal and chioce. Another option is to use Azure Infrastructure as a Service. If you have Azure subscription and account you may create a Virtual Network following the instructions and then add the desired number of virtual machines there. After you have your cloud VMs created it is necessary to configure them as MBrace nodes with MBrace Runtime and correct settings in mbraced.exe.config file. Both with Azure or custom cluster configuration there should be a client with MBrace runtime and F# - any F# supporting environment, e.g. F# Interactive, VS or any other - to initiate requests to the distributed system. Click "Create new cluster" button and follow the instructions. Indicate the number of worker machines and other settings for the cluster. There is also a wonderful tutorial how to use Brisk on Github. At this point the cluster is ready! Now it's time to set up a connection and prepare for boot. If you are not using Brisk and use Azure IaaS or your specific machines, it is necessary to initialize the nodes. 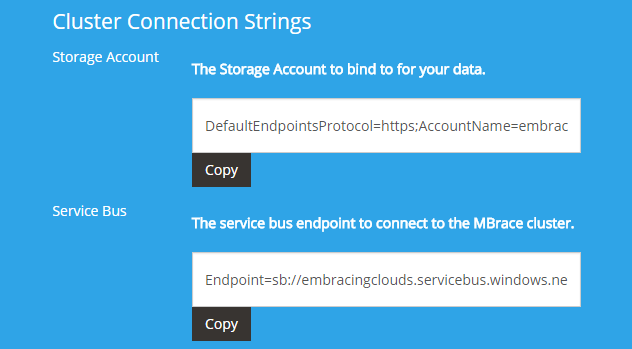 Here we have a list of nodes and connect to them using MBrace.Connect: Here we specify either IP addresses or the nodes or the hostnames, with the ports, sure. ... and SQL Server store. So choose the suitable one. Now there is work in progress to add more store types available. Now all the things are ready! The final step is to boot the runtime. We have everything ready to explore all the exciting features of MBrace. If you are curious - jump into the next part!